I got tagged by Ms. Kwana "K.M." Jackson to answer this set of questions that's making the blog rounds with authors. What's my "next big thing"? Hopefully the sequel to Spice and Smoke, Spice and Secrets, which comes out from Samhain Publishing this November! Well, it kind of naturally fed from the previous one. But, besides that, I've always been fascinated by Hindi-language cinema and the whole splashy world of Bollywood. I'm also a huge episodic television — soaps in particular — fan. So, I kind of put it all in a blender and poured it into a pepper-rimmed glass! Contemporary Romance and Multicultural/Interracial Romance. If this were a film, I'd cast Indian soap star Barun Sobti as Rahul Anand and Bollywood actresses Anushka Sharma and Shenaz Treasuryvala as Priya Roy and Sunny Khanna. Philip Winchester (Strikeback, Camelot) would play Shaw. Totally cheating on this question and giving you the one-sentence tagline instead: When fear writes the past, only love can direct the future. Neither. It's coming out from Samhain, and I don't have an agent. Six months, maybe? I'm a pretty slow writer, and I have a day job that takes up a lot of what could be writing time! Dude, I don't know. We need some more desi romance, so I can compare it to something! 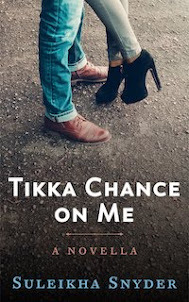 After years of being a devoted romance reader who immersed herself in other cultures' narratives, I really just wanted to strike out and write something different, something that comes from my own heritage and my own experience. I jokingly say "Indian people need love, too!" but that's actually very true. Romance, as a genre, shouldn't just be the purview of the West. So that definitely inspired me. But, on a more fun level, I know I was definitely influenced for Spice and Secrets by producer/director/actor Farhan Akhtar, after watching his behind-the-camera work with Dil Chahta Hai and his onscreen work in Rock On!, and also by Shenaz Treasuryvala's electric scene-stealer Rama Patel on One Life to Live. My Bollywood Confidential universe is this crazy experiment, wherein I'm testing out different genres within the confines of this faux film industry world. The first book was male/male. This one is my nod to contemporary category romance and the potential third...? Well, that's going to be a mythological paranormal. I know, right? Nuts. So what I hope will pique reader interest is that I don't "sit still." I keep moving. I'm always trying something new. Like it says at the top of my site: "Variety is the spice of love." Love this post. Thanks for playing. And you know you twisted my heart bringing up Rama fm OLTL.